I'm developing quite the collection of brooches. I put my ornate ones with my tee shirts and my crazy or mod ones with my ladylike cardigans. If you're in a pinch for a gift for mom, look into brooches. This is just a sample of what's online, but you can find them for cheap at any vintage or thrift shop. You can also secure some brooches in your hair with the aid of bobby pins. It's a cute way to add flash to your summer ponytail. LOVE the ducks. Geese? Waterfowl. I saw that bug pin at the store! 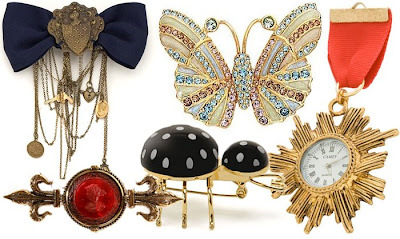 Only Betsey Johnson could make me want to wear all of her little bug jewelry. 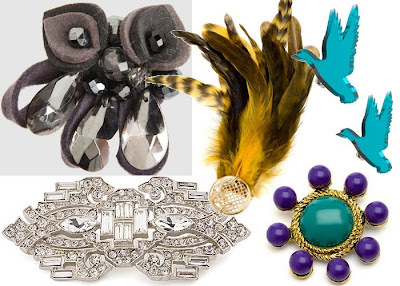 I have found some great brooches at the online boutique Goldyn. Check out shopgoldyn.com! Ooh, I need to wear more brooches. I've always been more of a necklace person, but maybe I can turn them into brooches temporarily? I am in LOVE with your BROOCHES, how can i purchase them?